Crush, Kill, Destroy - Featuring the most advanced combat A.I. to date—enemies flank, seek cover, and utilize teamwork to take you down! Battle automated sentries, aerial drones, and other lethal foes—tactical maneuvers are based upon actual military strategy! Solve hacking mini-games to whet your nerdly appetite, then get back to blasting! Console-Quality Graphics - It ain't just pretty—it's gorgeous! Advanced lighting effects, beautifully rendered environments, and pro voices make this one of the most advanced games for your smartphone!! From the mind of a madman - Survive the onslaught of Dr. Simon's deadly creations, including level bosses, mutated grunts, killer machines, and more! The game comes in at just over 350MB so while it's not massive, it is something to be aware of for sure. If you're looking for the trailer to see the gameplay before you dive in, you can jump below to get a good look at it otherwise, hit the link below to download Shadowgun today. 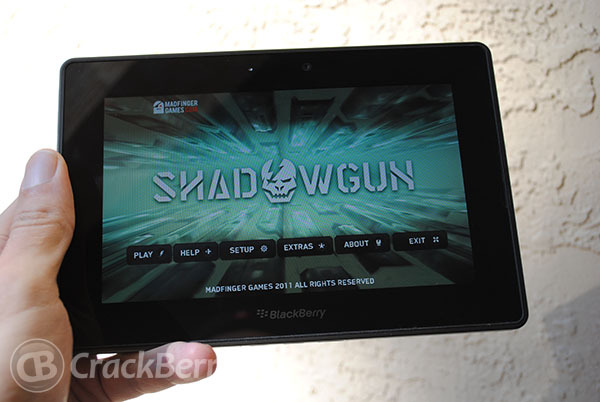 Now, I wonder if Madfinger games will also bring Dead Trigger to the PlayBook as well.